The white-necked rockfowl (also known as the white-necked picarthartes) is a large and unusual bird with a bright chrome yellow and black featherless head and a long neck and tail. It is considered one of Africa’s most desirable birds by birders and is a symbol of ecotourism across its range. They are usually a silent bird however on the occasion that they do call, the sound has been compared to the clucks of a chicken. Unknown but believed to be long-lived. The total population of the white-necked rockfowl is estimated at fewer than 10,000 individuals and is suspected to be declining rapidly due to forest clearing and degradation across its range. Therefore, the species is classified as vulnerable. It is and is endemic to the Upper Guinea forests of West Africa, and is native to Côte d’Ivoire, Ghana, Guinea, Liberia and Sierra Leone. 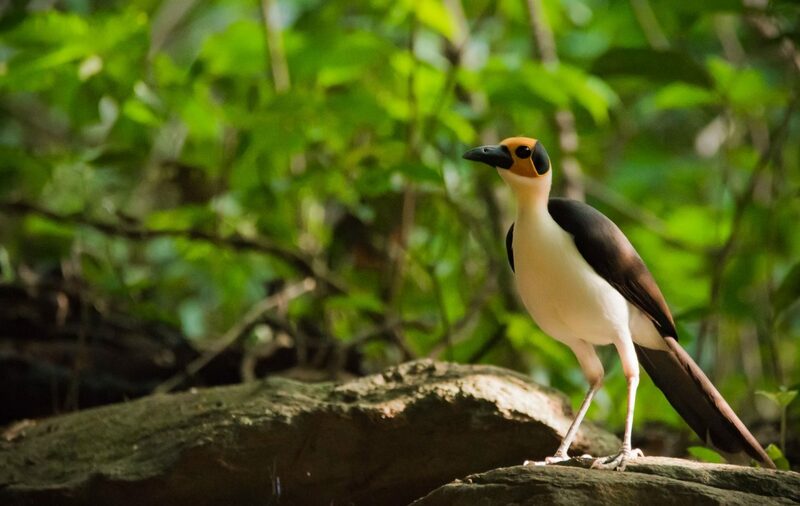 The rockfowl mainly lives in rocky, hilly terrain in lowland primary and secondary forests and often lives near flowing streams and rivers so that it can have access to wet mud for constructing their nests. They have occasionally been found in highly degraded sites and near urban areas. The white-necked rockfowl primarily eats insects which include cockroaches, grasshoppers and ants and have been observed eating millipedes, centipedes, snails, earthworms and small lizards and frogs. The species has a highly fragmented distribution and its primary threat throughout its range is habitat degradation due to commercial logging for timber. In Ghana, where the species were once thought to be extinct, the rockfowl is also threatened by bush-burning and conversion of degraded forests to plantations and in Sierra Leona, children have recently been observed taking their eggs. Laws exist in Sierra Leone, Liberia and Ghana to protect the white-necked rockfowl, but enforcement is minimal. Most of the remaining colonies in Guinea, Sierra Leone and Côte d’lvoire are on protected land, while Liberia and Ghana’s colonies are mostly unprotected. Sierra Leone recently upgraded its protection of the Gola forest by turning it into its second national park, Gola National Park, and has announced that the country intends to work with Liberia to form a trans-national park protecting the Gola rainforest. Moreover, there are efforts underway to raise awareness of the species and plans to work with local communities to secure major nesting sites.